Between 2010 and 2011 China’s power system passed the one million kilowatt mark (kW), making it comparable in size to the US. In the years 2010, 2011 and 2012 the system was growing at around 10 per cent a year, by amounts varying between 83 million kW and 94 million kW each year. 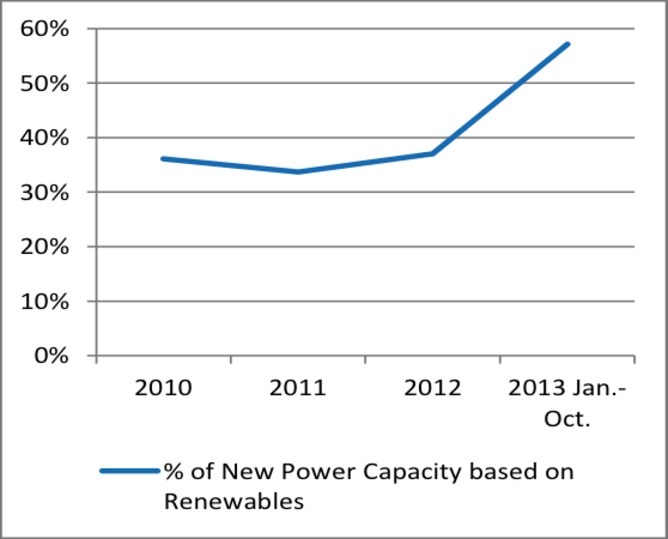 The remarkable feature is that the share of renewables has leapt in significance. Whereas non-fossil fuel capacity additions totalled 31 million kW in 2012, these renewable and nuclear power stations have totalled 36 million kW so far this year – and could be projected to be 43 or 44 million kW for the whole year. That’s one new non-fossil power station of one million kW nearly every week! But the even more astounding feature is that the additions powered by renewables now exceed those powered by fossil fuels (coal and gas) and nuclear. Capacity additions involving hydro, wind and solar PV have totalled 33.8 million kW so far this year, while capacity powered by fossil fuels amounts to 27.0 million kW and by nuclear is just 2.2 million kW – or 29.2 million kW for fossil fuels plus nuclear. The renewables plus nuclear in 2013 make up 57 per cent of new capacity additions, while those powered by fossil fuels alone are down to 43 per cent. This is one small blip on the statistical chart. But it is one giant leap for China. It means that the growth of its electric power system – that underpins the entire modernisation and industrialisation of the country – is now being powered more by renewables than by fossil fuels. Wind and solar are growing at a great rate, while nuclear is barely moving. We summarise this data in the chart below. It is a further remarkable coincidence that in the same week as the energy administration figures were released, China Railway revealed the building of the country’s high-speed rail network passed the 10,000 km mark – by far the largest in the world. China’s high-speed rail is massively more efficient as an inter-city transport system than private automobiles and air. The country is also greening its electric power systems and consequently saving huge quantities of carbon emissions. 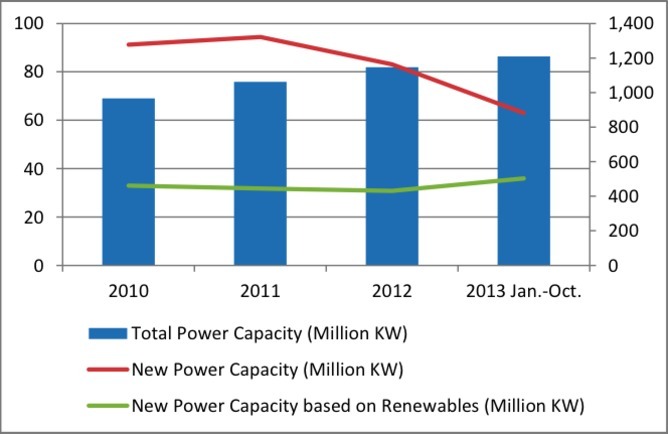 These results for 2013 reveal just how strongly China is swinging behind renewables as its primary energy resource. This is consistent with the 12th Five Year Plan (running from 2011 to 2015) which projects that China will be generating 30 per cent of its electric power from non-fossil sources overall by 2015. This is a level far higher than comparable industrialized countries. And it is consistent with the allocation of capital to strategic industries including those producing cleantech goods, which are anticipated to be growing at 15 per cent per year by 2013 – or at twice the rate of the country’s GDP growth overall. In other words, renewable energy and cleantech industries are seen by the country’s leaders as becoming a pillar of the industrial economy – along with the steel and automotive industries. It’s just that it is happening even faster than China anticipated. What a contrast with the situation in Australia. Here we find the new government using their “mandate” to abolish the carbon tax as an excuse to jettison any progress that has been hard won in Australia in renewables and cleantech industries. A bill to abolish the Clean Energy Finance Corporation (CEFC) – Australia’s Green Bank and fabulously successful in driving the financing of new cleantech ventures, was passed in the House of Representatives with Coalition support, but rejected in the Senate. This probably gives the CEFC a reprieve of six months until there is a new Senate in place on July 1 next year – but the tide might have turned by then and the government might be less anxious to do away with an obviously successful CEFC. Ministers in the new government take every opportunity to deride the renewables and cleantech sector, even though it is one of the few sectors to show any growth in Australia. By contrast they take every opportunity to promote coal and gas extraction – as if that could possibly be where our future lies. A new report from Oxford University underlines the fact China’s demand for coal is dropping, and Australian coal infrastructure could become “stranded assets”. Australia should be looking to build new manufacturing industries in cleantech and renewable industries – for our own benefit, and to take over some of the jobs lost as the vehicle industry shrinks. 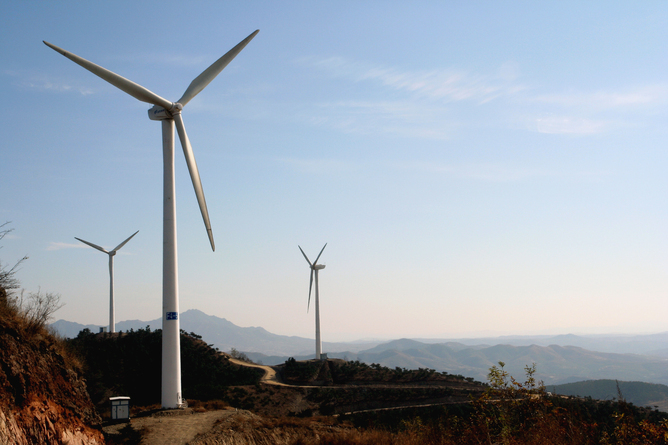 China shows that smart countries build their energy security on strong foundations of manufactured systems – wind turbines, solar PV cells, and solar thermal arrays – rather than on mining and extraction of ores. Manufacturing industries will underpin the urbanized world of tomorrow, and the firms that contribute to them will reap increasing returns. Firms contributing to mining and extraction of resources will inevitably be forced to accept diminishing returns as the resources get harder to access. The fossil fuels sector is promoting “alternative” fuels like coal seam gas and tar sands oil as the next bonanza. In the US this has reached a crescendo, with big fossil fuel companies (and Australia’s BHP Billiton) falling over themselves to become part of the new oil rush. But while it relieves the country of its heavy dependence on Middle Eastern oil, it does nothing to modernise the energy system through renewables and cleantech – and consequently China moves further ahead as the lead player (along with Germany and to some extent Japan). The new data from China’s energy administration reveal just how committed China is becoming to its renewables sector – and how that will underpin the country’s energy security. It is worth pointing out that this will have a dramatic impact on China’s carbon emissions, slowing their growth and hastening the year when they will actually start falling. John A Mathews is professor of Strategic Management at Macquarie Graduate School of Management, Macquarie University in Sydney, where he has taught graduate MBA classes for the past decade. Dr Hao Tan is a senior lecturer in International Business at the Newcastle Business School, University of Newcastle, Australia. This post originally appeared here.